At the start of a new musical there is often a frisson of excitement that doesn’t often occur with new plays; the rarity of a new book, and the possibility that you could be in the audience for the next Chicago, Cats or Sound of Music or, alternatively, Gone with the Wind or (fingers crossed) Carrie: The Musical seems to add a certain expectation to the evening. As a result it is with something approaching disappointment that it must be reported that Dessa Rose proves itself to be an entirely functional musical, with performers and musicians’ skilfully executing what is, in the main, a rather humdrum book from Lynn Ahrens and Stephen Flaherty. Whilst the production has a number of highlights it covers so much ground that you are pulled across decades as quickly as you are across musical styles. It is often not clear when or where you are, and this causes its central theme – that there is a bond between ‘women’ that can cut across the race and income divide of the prejudiced 18th century South – to never be satisfactorily addressed. Ahrens and Flaherty have some form in producing surface-level musicals that work more as a Wikipedia summation of American history than as a complex emotionally engaging narrative. Ragtime, last seen in the summer of 2012 at Regent’s Park Open Air Theatre, was taken from E.L Doctorow’s novel, and was similarly fated to be rendered down into a deeply and problematically oversimplified tale of the oppressed masses instead of a complex view on America’s rich social-cultural history. Musicals have taken a leading role in addressing racial prejudice and the experience of black people in America. Porgy and Bess is often held up as one of the greatest American musicals, The Scottsboro Boys finally emerged in the last couple of years as one of Kander & Ebb’s finest creations and, in the same year Ahrens & Flaherty produced Dessa Rose, The Colour Purple was also adapted for the stage. These are not small shoes to fill and Dessa Rose, for all the heart of its performers, never comes close to filling them. 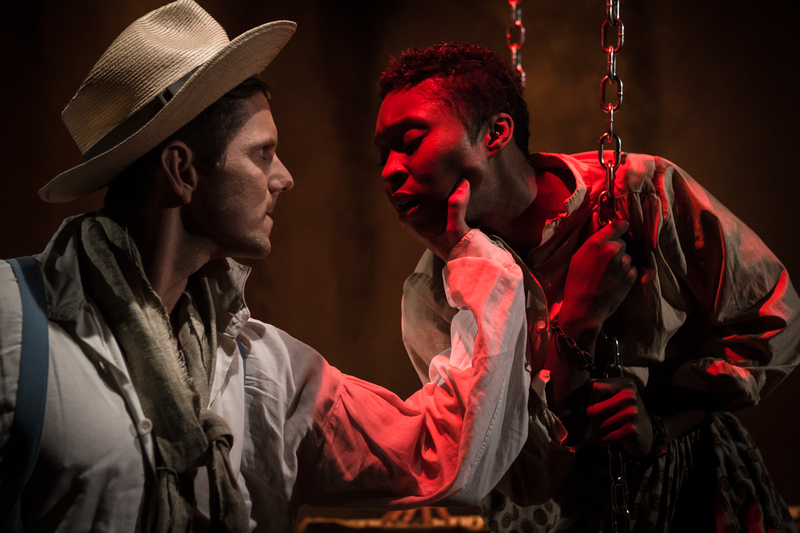 There is nothing that comes close to matching Summertime or It Ain’t Necessarily So as musical numbers, it doesn’t have the natural, shocking wit of The Scottsboro Boys and the twin themes of racism and sexism are far more clearly articulated in The Colour Purple. Dessa Rose is strongest when the performers and musicians are doing what they do best and the message gets forgotten about for a while. There is a tight-knit quality to the ensemble that suggests a strong rehearsal process and credit must go to Andrew Keates (Director) and Sam Spencer Lane (Choreographer) for some remarkably agile set-pieces on the tiny Trafalgar stage. 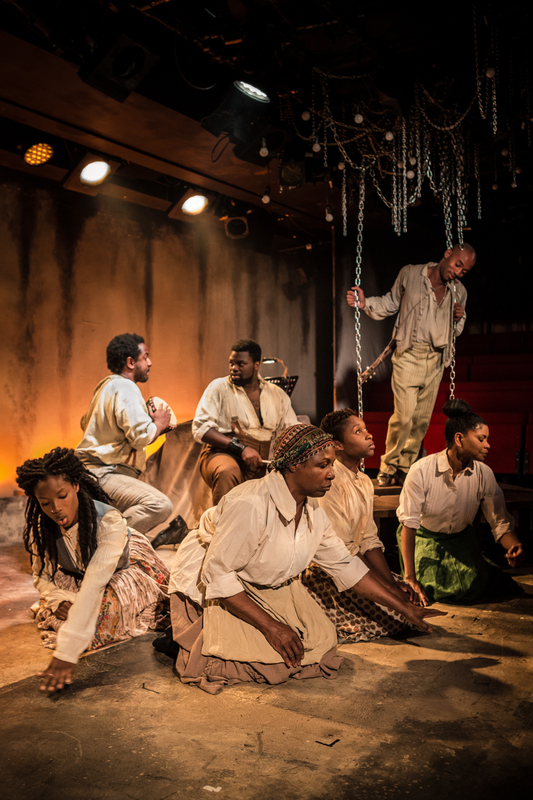 It is not easy to work on a thrust stage with a cast of twelve but it is an impressively fluid production, and rarely do the actors get under each other’s feet. Individual songs are dotted across the cast and are performed with verve and energy that can’t be faulted. The highpoints comes in ‘Twelve Children’ and ‘The Scheme’ which are so different in musical style and performance it almost feels like they have fallen out of a different musical. However it is the closeness of the ensemble that really helps to lift the music, and it is those that evoke the traditional spirituals, gospel and chorale songs of the time that are most enjoyable. You can listen to songs like Fly Away and Comin Down’ the Quarters again and again and they still won’t lose their power to make you clap your hands and join the beautiful harmonies of the cast. 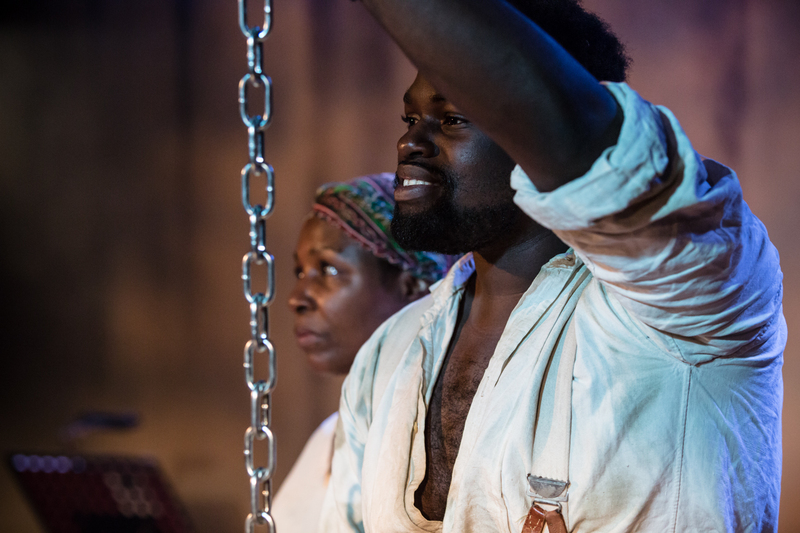 It is a mark of the strength of the ensemble that they deserve as much a mention as the leads; in particular Edward Baruwa provides a strong presence; light, graceful and with a natural comic bent whilst still maintaining a strong physicality that suggested a lifetime spent in hard servitude. It is the case that I didn’t buy the relationship between Baruwa’s Nathan and Cassidy Janson’s rich, white Ruth for a moment but this is no fault of the actors and all the fault of a script that gave no opportunity for this story to breathe and express its own truth. Also worthy of mention is John Addison; adroit in a number of minor roles and a performer that manages to catch the eye whilst doing seemingly very little. Cynthia Erivo, as Dessa Rose, has a voice that can effortlessly move between the depths of southern spiritual and the light, tremulous highs seen in her brief relationship with Kaine. She is capable of a fearsome, spirited anger but perhaps a better balance could be reached if the audience are ever to believe that she might find it within herself to put her differences aside and work together with Ruth. Dessa Rose isn’t a disappointment but it isn’t anything special either. It is however far better than a number of musicals currently in the West End and is also much, much cheaper than any of them. For £15 you will be guaranteed a seat no more than five meters away from the stage and will spend the evening with a very talented cast. For dedicated musical fans that is not a bad offer.